A soffit is typically installed in the area beneath the eaves of a house, and extends from the side of the building to the edge of the eave. 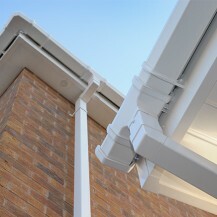 Its purpose is to protect the eaves and to provide air circulation that helps to draw moisture away from your home. As soon as traditional roofline soffits begin to show signs of damage or rotting they should be replaced. 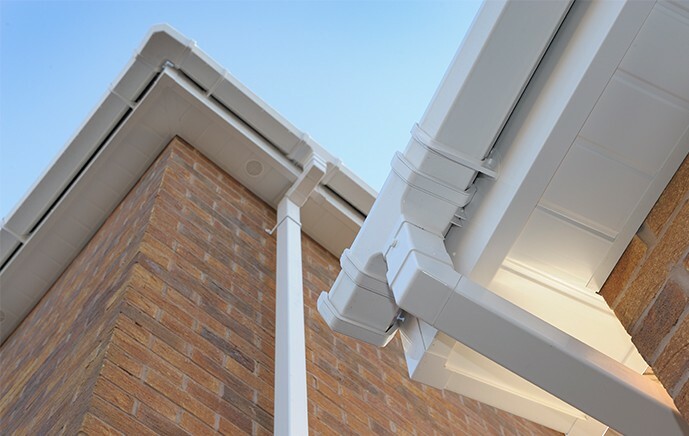 Soffits are available in a variety of sizes, ranging from 90mm to 600mm wide, and are manufactured in a choice of materials including uPVC, aluminium and solid resin. In addition to traditional white, soffit boards are readily available in a wide choice of wood grains and colours to help enhance the overall appearance of your home. This simple flat finish design is a popular choice for soffit applications. The general-purpose soffit board gives any roofline an attractive, clean-edged finish that helps to maintain airflow through the loft space, prevent damp and protect rafters from rot. Tongue and groove soffits have an attractive panelled effect that offers an aesthetically pleasing finish for your home. This style of soffit board uses an interlocking mechanism that eliminates the need for surface mounted mechanical fixings such as screws and nails. Ventilated soffit boards help to prevent moisture build up in the roof space, which can cause timber eaves and joists to rot over a period of time, weakening the roof structure.